What can you say about the Soaring Wings Marathon / Half Marathon / Relay Race? To me it is one of the best races located here in Arkansas because it is well-organized and has a ton of support from the volunteers and spectators, but it has a low degree of difficulty because of the hills. 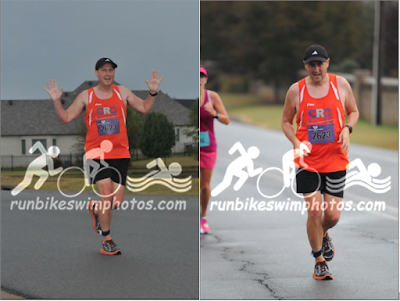 I have had the pleasure of running the Half Marathon a couple of times, once in 2011 with a 1:47 time (where I hurt my knee at mile 6 and still finished with a good time) and 2012 with a time of 2:18 (where I had a horrible race due to lack of training). So in actuality, I have had issues both times running the course. This year, though, I decided to mix it up and run the Half Marathon as a Relay with my little running buddy, Braden. I didn't even know the relay was a two-person event until September and my first thought was to actually see if I could have Braden team up with someone else for the relay, then I thought, "What am I thinking, I could run the relay with him instead!" We did have some obstacles we had to clear before I officially signed us up. The big sticking point was Braden's age. Since he is only 7 years old, the rules stipulate that he has to run with someone for his portion of the relay for safety reasons. Our only option was for him to run with his papa Bernie (who was running the Half) and initially Braden wasn't liking the fact that he would have to run at a slower pace to participate. After a few conversations, I told him that he should treat it like a fun run and he would still get a big medal at the end regardless on how we finished, so after finally relenting and seeing the bigger picture, we signed up. The way the relay is set up is that the runner who starts the race runs 6 miles and then switches the timing chip to the second runner who finishes the race running 7.1 miles. At first I was going to let Braden have the glory and run the second leg to finish up the race, but since he had to run with Bernie, it would have done us no good for me to run a fast six miles and then having to wait for Bernie to arrive so he could finish out..not to mention the longer distance and hillier terrain on the second leg. The great thing for Braden was that he got to experience a hilly run the week prior at the Survivors' Challenge 10K, so what little hills he had for his portion of the relay wouldn't be so difficult. Something that we hadn't had in any of our races, we were prepping for all week...the rainy weather. It seemed like an eternity since we had our last rain, and wouldn't you know it, it was predicted to rain the whole weekend. I swear it seemed I was looking at the Weather Channel, AccuWeather, and Weather Underground every hour for the 72 hours leading up to the race. The worst scenario would've been if there was lightning, then the race would've been canceled all together. After I picked Braden up for school on the day before the race, we went to go get our packet and received clarification on how the relay worked, purchased a hat for him at the Sporty Runner to keep the rain out of his eyes, drove the course and talked about logistics, and had some Italian for dinner. When we got home, we went straight to bed because we had to get up at 4:45 a.m. to get ready and get out to Conway for the 7 a.m. start. When we got up in the morning, I checked the Weather Channel and it said there would be thunderstorms during the race, but AccuWeather said rain, but mostly periods of just being cloudy during the two hours we would be on the course. I was keeping my fingers crossed hoping that AccuWeather would be correct! Once we got to Conway, we dropped Braden and Bernie off at the starting area and drove to the relay point where I'd have to wait for Braden and take over from him. At about 6:20 it started to rain hard and I was praying that the race wouldn't be delayed by weather, but the rain only lasted a few minutes then it stopped all together. At 7 a.m. it was cloudy and the temperatures were in the upper 60's (which was good), but it was very humid. Braden's part of the relay went really well. They got off to a good start and a quick pace as well. Braden said that he told Bernie that he was going too fast at the beginning for his half marathon and that he needed to slow it down a little if he was going to have a good race time. Braden also said that he didn't like going slow up the hills, but even though the pace was a little slow to his liking, it was only about 6 seconds slower than his PR pace at the 6 mile distance. In the meantime, I was waiting patiently at the relay point hoping that we wouldn't be too far behind the other teams once we made the switch. Prior to the race, I had looked at last year's results for the relay and I figured if we finished with a time of 1:56, we would place in the top 5. The thing I noticed was that none of the teams who finished in the top 5 were running as teams this year, so I though we might have a shot at getting an award for finishing in the top 3. The first relay person came in at a very quick time, but his partner admitted that she was going to be a lot slower. A minute later the second relay person came in and he handed it off to his teenage son (I knew they were definitely going to be the team to beat). A few minutes after that the third relay person, a 10-year-old girl, came in and handed it off to what looked like another fast runner. Another couple of minutes went by and I was hoping Braden was getting close. As I went to try to get a good vantage point to wait, here he came! After stopping to take the velcro strap off his ankle (which took forever!) and putting it on mine, we were in 4th place and he ended up running a rain-free part of the relay. I wanted to get off to a quick start, not only to start catching up to those in front of me, but to also put distance between me and any other relay teams that were behind me. The first mile for me was mostly downhill and I went at a much quicker pace than I had for my most recent training runs. I was passing runners right and left and no one was passing me, so I knew I was in pretty good shape. I started to slow it down because I knew I couldn't keep the pace I was going and it started to get a little hilly as well. 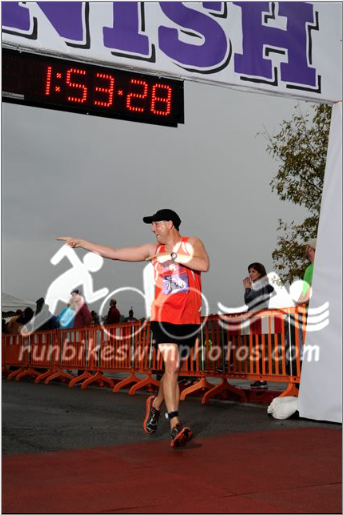 When I got close to the mile 9 mark, I was able to pass the runner from the first relay team and at that point we were now officially in 3rd place and at this point it finally started to rain a little, which actually felt good to run in. I tried to keep close to the 8:00 per mile pace that I had been maintaining, but I knew that miles 11 and 12 would be tough because of the hills (especially mile 12). My strategy once I started mile 11 was to try to keep a good pace, conserve some energy, don't let anyone pass me, and hopefully catch up to whoever was in 2nd place. Everything was going ok until the hill on mile 12. It was just so long and tough and for the first time I had a runner pass me who I had passed just earlier. I rarely do this in a race, but during the last few miles, I kept on checking behind me to see if I saw any purple bibs (the color for the relay runners) and once I reached the summit of mile 12, it was pretty much all downhill to the end and I knew I wasn't going to let anyone get past me. Making the final turn toward the finish line I was thrilled to know that we were going to place and as I was getting ready to cross the line, Braden was cheering me on as I told him the good news! We finished with a total time of 1:53:02 at an 8:38 pace and finished 3rd out of 54 teams! Our combined finishing time was faster than I had anticipated and my pace was quicker than I had been doing on my training runs that had been on flatter roads. Most of all, I was happy that we were both able to run a clean race without any issues. This was the first time I had ever run a relay race and I had a blast being able to do it with Braden. Not only did we have a great result, Bernie came in 1st in his age group in the Half Marathon, and my brother Greg came in 2nd in his age group in the Marathon. Braden, because he loves to run, helped my brother and another Conway Running Club member finish out their marathons by running the last tenth of a mile and encouraging them along the way. Once again, the support and volunteers were outstanding (along with the food at the finish!) and it was wonderful seeing all of our friends from our running club as well. Ultimately I was happy to see that AccuWeather was more accurate with their weather predication and even though I won't be here next year to run as a team with Braden, we'll definitely do it again upon my return! How does one describe the Survivors' Challenge 10K course? Braden said that he understood why Challenge is in the name...because of the hills! There was a long sustained hill from the half mile mark to the two mile mark, several rolling hills that seemed to have more uphills than down and then a beastly hill right before the mile five marker. Thankfully, the last mile was more downhill and it provided the opportunity to make up some time before the finish. Even though I knew this race was going to have some elevation gains based on the course map, I didn't foresee the amount that it did have, and on top of it, I didn't know if Braden was going to be able to handle it. Normally, I wouldn't think this, but Braden came off of a week where he ran probably his worst race of the year in Cabot at a 5K event after basically giving out half way through the race. 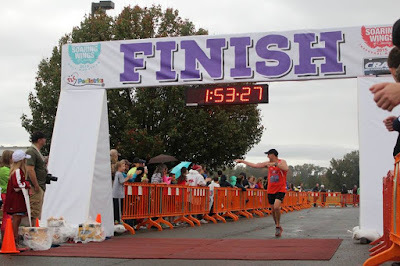 He felt fine at the beginning of the race, where it was perfect weather and the course was flat, but then he started complaining about feeling bad and he finished with a time of 29:01; 4 minutes slower than his personal best. Later that day, he started running a fever and he was sick for the weekend. I held him out of track practice on Monday, but on Tuesday he said he felt fine enough to run in Conway on a long run. We got a couple of miles in before he gave out, so I left him with his mom while I ran by myself. A little later into my run I saw him running by himself, so I let him catch up to me and we ended up running just shy of six miles with a few stops in between. Originally, I had planned to drive to Fort Smith (a two-hour trip) on the day of the race, but then I started to relive some of the nightmares I had from the Watermelon 5K where I had to get up super early to drive down and had a terrible race because of lack of sleep and the heat. Instead of making that same mistake, I went ahead and reserved us a room that was close to the restaurants and the course. We got to Fort Smith early in the evening, went to Olive Garden for a little pasta, picked up our race packets, then watched a movie. After we got back to the hotel room, Braden zonked out and we were able to get a good nights rest before the race. Conditions for the race were great! Even though it was a tad windy and cool (low 50's), it was also overcast and I told Braden once we got going he would warm up. Before the race, in the runner's chute, we had a nice conversation with the Western Arkansas Runners Club president, Sheri Nichols. 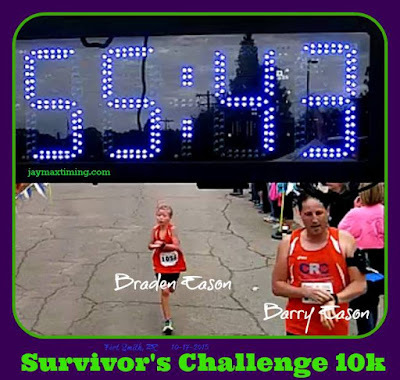 She was encouraging and praising Braden and told him that she remembered passing him at the Chile Pepper 10K a few weeks earlier and that she would be running at about the same goal pace for the Survivors' Challenge. We were going to shoot for an 8:50-8:55 pace, but I told him that he needed to take it easy on the uphills and we would try to make it up on the downhills. We got off to a clean start with a lot of fanfare since there were more than a thousand runners out there...most of them 5Kers who were going to start 15 minutes after us. It didn't take us long to settle in, but I knew that we were going to started ascending the first long hill in short order. He was running pretty decent and finished the first mile at an 8:58 pace. The second mile was all uphill and I was encouraging Braden all along the way. We have run some minor hills during our training, but nothing compared to what this race offered up. I kept on telling him that he was doing great and that we had just a little further to go before it would flatten out. His pace for this second mile uphill climb was 9:24. I thought we would be in the clear for a while, but our flattened out portion of mile three was very short, before having to head up another hill. I was staying a few seconds ahead of him to see what was coming up while lying to him that it was going to get easier when it actually wasn't. Three quarters into the third mile Braden had to stop on a flat/downhill part of the course because of side stitches. I told him that if he had to stop, to at least walk fast or try to do it on an uphill part of the run instead of a flat or downhill portion. With it being so early in the race, I was concerned that he wasn't going to be able to handle the rest of the course, but he quickly started running again and we finished the third mile at a 9:36 pace. The fourth mile consisted of some rolling hills and once again he had to stop for the side pains during a downhill portion, so I had to encourage him to keep moving and he was able to pick it up again. He was able to pick up a little bit of time and finished the fourth mile at a 9:23 pace. He started to feel discouraged about having a decent time, but I told him that we just needed to get through it and that the worst was behind us, other than one more steep hill before mile five. The fifth mile had a lot more downhills and I told Braden that we only had little more than two miles to go and that now was the time to start getting our time back that we lost. He kicked it into gear and we started to pass some people who had passed us the previous couple of miles. As the mile five hill was drawing closer, I could see where the 5K walkers were converging with the 10K runners, right before the hill. I told him that the hill was coming up and that we were going to push it extra hard to make it up. Needless to say, he put it into another gear and attacked the hill like it was nobody's business! It was all I could do to keep up with him, but right before we got to the top he had to slow it down because he couldn't sustain the speed he had been going. I told him to take it a little easy and that we were almost to the top. At the top was the mile five marker and he was able to finish the fifth mile at an 8:14 pace! I thought it was going to be all down hill for the sixth mile, but there was one little last hill we had to navigate through, but as we were passing the walkers, Braden said he got a sharp pain in his side and we had to stop for about 10 seconds. Once again, I encouraged him to at least keep walking and that we were doing a great job of working our total pace back down. He started up again and during this point Sheri Nichols was ahead but within sight. She had been in front of us all race but we were getting closer than we had since the beginning. At that, Braden said that he wanted to beat her so I told him he would need to really turn it on to catch her. 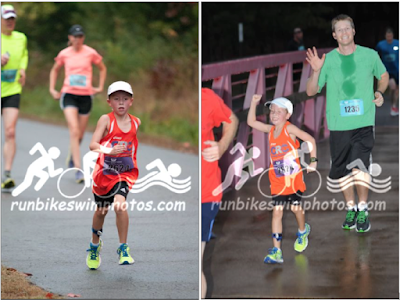 It was all downhill and he started to put it into another gear as we finished the sixth mile at an 8:28 pace. The last .20 was a steep downhill and Braden was driving to the finish. We were dodging walkers and there was a lot of support from the crowd. Ultimately, it felt like we were flying as we passed Sheri clocking our last .20 at a 6:04 pace and finishing with a time of 55:37. He missed his PR by 28 seconds, but if it wouldn't have been as hilly and with the few stops he made, he would have definitely had a new personal best, but I know that all courses can't be flat so it is what it is. Braden was getting all sorts of high-fives after his finish and I was definitely proud of the way he handled such a tough course with his very limited hill training. Braden was the only one in his age group which obviously means he came in first place, but that didn't stop Sheri from saying some very nice things about him at the awards ceremony including that they now had a running competition going on and that he bested her this race after she had beat him in the previous one. Overall, I thought it was a very nice race and I enjoyed the course and even though Braden wasn't fond of the hills, he still had a great time and I thought it was also a nice touch that everyone received a finisher's medal. Since this was a Grand Prix non-championship race, Braden collected the full 20 points, but since he has already maxed out his point total, his total points remain at 250. He had already clinched first place in his age group for the Grand Prix at the Chile Pepper 10K, but I'm glad he put together an outstanding effort for this race as well. Unfortunately, the Survivors' 10K was our last Grand Prix race of the season. We would've run the Spa 10K in Hot Springs on November 21, but Braden has a USATF XC qualifying race that morning in Little Rock. The Grand Prix has afforded us the opportunity to meet a lot of great runners and many new friends and hopefully Braden will be will be rewarded for his accomplishments by the running community on December 12 because he is a nominee for Youth Male Runner of the Year! He has some pretty strong competition, but I know, no matter if he wins or loses, he'll always be my most favorite runner! 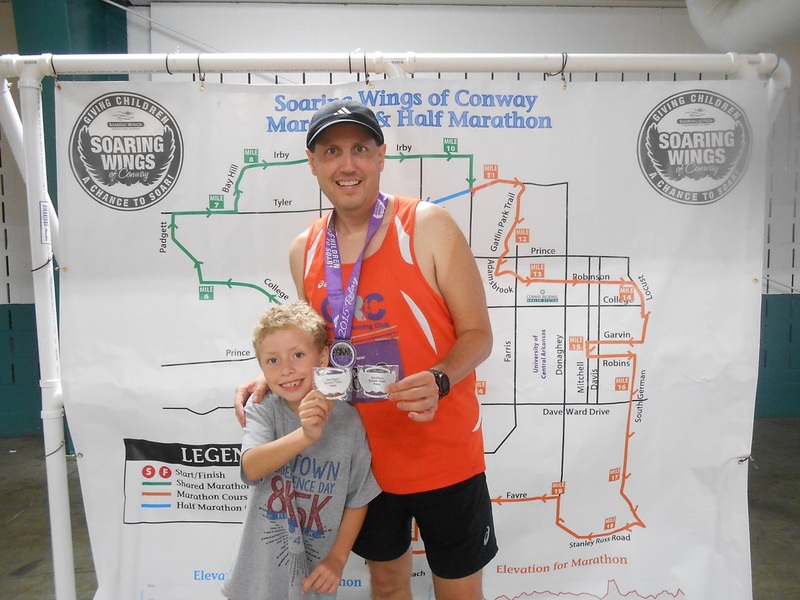 Our next race is the Soaring Wings Marathon / Half Marathon / Relay where we will run the two-person half marathon relay. Braden has been looking forward to this race for a long time and we even got to pick our own team name...Team Running Down a Dream. He will start us off by running the first 6 miles and I'll run the last 7.1, so be on the lookout for the orange father-son duo! to for a great while. Not only was it his first cross country race, but it was an Arkansas Grand Prix Championship race that, if he won, would enable him to come in first overall in his age group for the Grand Prix season. The Chile Pepper race is quite an experience. 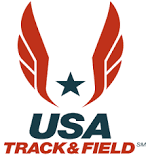 It is held at the cross country course for the University of Arkansas and it is an all day event. Not only was there an open 10K and 5K race for runners such as Braden, but there were also collegiate, high school, and junior high races as well. Even though a lot of the runners were from Arkansas, there were a bunch from Texas and Oklahoma high schools as well as many major college teams from the South and Midwest. Since this was a cross country race, Braden was excited to use the spikes he runs with in track and field. His normal track spikes are 1/4" and I had to replace those with 3/8" spikes for the grass terrain. Though Braden had been posting some solid training runs prior to the race, I knew that it would prove more challenging for him to run on grass instead of a road surface. At our race in Dallas the week prior the temperature was a little too warm for our 10K race, so at Fayetteville Braden got treated to temperatures in the mid-40's. I packed warm and cold weather clothes for him and told him that he would have to use his best judgement on what to wear because I didn't want him to worry about getting too hot or cold during the race. Since I wasn't able to go with Braden to Fayetteville, his papa Bernie handled the running logistics with him. Braden basically had to run 2.5 loops and he said that there was a tough little hill that he had to negotiate three times. By and large he said that he didn't like the course because it was hilly and had potholes, but I said he needs to get used to terrains like the one he ran because that is the way cross country courses are designed and some provide even more challenges than the one he ran on. I also told him that prior to the race to wear his headband to keep his ears warm and to take it off right before the start because I knew he would not want to wear it through the whole race. Well, he didn't heed my advice and after the first mile he had to take off the headband because it was too warm for his ears and he had to tote it for another couple of miles. I can't give any splits on Braden's times because he deleted them on his running watch. His reasoning was that he thought he had run the race in 58 minutes and he didn't want to save the time, so I had to tell him that in the future not to do that since it helps me keep record on his performance. He did say that he tried to keep a steady pace, but had to slow down during the middle portion of the race. During the awards ceremony, the race director told Braden that when you look in the dictionary for the word stud, you'll see Braden! Braden was the only runner in his age group and won by default, but what made it really cool was that he was the youngest runner to ever finish the Chile Pepper 10K in its history. Even at the packet pick-up they couldn't find his stuff because they were looking in the 5K packets until he told them that he was running the 10K. Braden received a Super Fast Pepper cape as his first place reward along with $15 in ChileBucks to spend at the festival. He bought himself a t-shirt from the race and also a bottle of hot sauce for his mom and dad (we collect hot sauce bottles!). What was really unselfish and kind was when he used $5 of his ChileBucks to buy sunglasses for another fellow runner from the Cabot Cruisers running club who didn't win anything because she didn't place in the top five. Braden and her have gotten to know each other through the Grand Prix and other local races and he felt like she should have received something. It warms my heart when he shows random acts of kindness towards other people! Because this was a Grand Prix Championship race, Braden collected the full 30 points that he needed to reach 250 points and clinched first place for his age group in the standings! Since the Grand Prix is setup to tally best point totals from five championship and non-championship races, he cannot get anymore points for the rest of the season. Overall, this race provided a valuable training opportunity for Braden because in November he'll be running a 2K cross country race in Little Rock to qualify for the Junior Olympic National XC Championship in Albuquerque, New Mexico in December. Until then we have a few more 5K and 10K races including his final Grand Prix race in a couple of weeks in Fort Smith...the Survivor's Challenge 10K.